“From an artist’s point of view, a review in a magazine is a very valuable thing, since one’s own work is framed by a critical contribution. That is something quite different from a book, a catalog or a purely theoretical discussion,” said Arno Gisinger in the course of the panel discussion “On Publishing Photography,” organised by Camera Austria International and EIKON as part of this year’s Les Rencontres de la Photographie in Arles. On the initiative of Abigail Solomon-Godeau and Gisinger, this talk followed a panel devoted to the same subject and held in the French capital—thanks to the support of the Austrian Culture Forum Paris and the BKA. Following on from those events, the basic focus of the present 99th edition of EIKON is on the questions raised in Paris and Arles: What distinguishes the print magazines that focus on photography, can meaningful synergies be created between printed and digital forms and to what extent is it important, especially today when we are constantly awash with virtual information, not to neglect content that has been committed to paper? Basically, the printed journals are still our best guide to preserving an overview within the digital noise, because they filter out what is most substantial for the reader. In the first place, “In Focus: On Publishing Photography” again brings together the fundamental ideas expressed by Abigail Solomon-Godeau at the beginning of the lecture program. 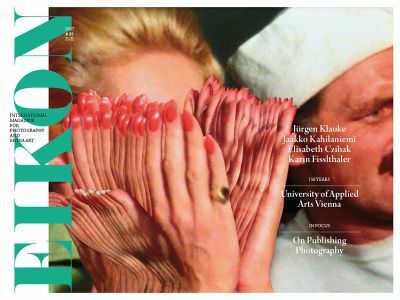 In addition, on a practical level, the editorial teams of EIKON and Camera Austria International have called for selected photography magazines to make their own presentations as part of this segment by giving them carte blanche (including their own responsibility for editorial oversight) to design half a page each. Then, in conclusion, a table provides a rough overview of all the invited media, in which, of course, for reasons of completeness, the two hostesses cannot exclude themselves.